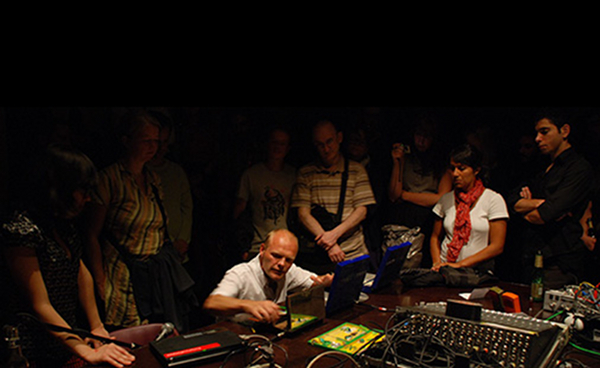 Tore Honoré Bøe is a Norwegian transmedia artist now working and living in the Canary Islands. His worklist is immense, counting hundreds of releases, exhibitions and performances. Over the last twenty years he played a lot of concerts, given workshops, published books and a multitude of recordings in almost any format available. He has exhibited visual art and submitted material to a vast load of magasines and blogs. He has also collaborated in various ways with a roster of international artists such as Roel Meelkop, Lasse Marhaug, Lee Patterson, Jochen Arbeit, Derek Holzer, Jarboe, Andy Bolus, Helge “Deathprod” Sten, NU Unruh, Terje Paulsen, Mick Harris, Guido Huebner, Michael Gira, Ronnie Sundin, Johannes Bergmark, Ellen Røed, Bryan Day, Mark Spybey, Erik Honoré, Jan Bang and Kim Xmazz. He is as hard to nail down as mercury, as contrast is his main focus. This makes it impossible to give a full description of his work, and makes his general work very hard to promote. His approach to the artistic process is ritualistic, where hands-on creation, interaction and dynamics are among his main motives. This autumn he is ending his eight year long work under the Origami Boe moniker. He will present material from his electro-acoustic series “Omaonotopetokion”. He will apply his almost famous “acoustic laptops” and other sources for sound. This material will only be presentes on special occasions, such as this.